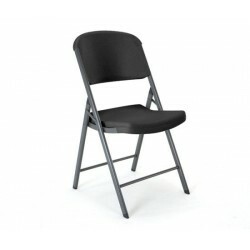 Shop our folding chair solutions for your needs. Great for school and churches as well as use for friends and guests at your home. Free Shipping on all orders! You asked for it, you've got it--the most comfortable folding chair on the market is now available in a convenient single pack! 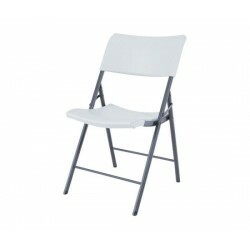 Lifetime contoured folding chairs are so popular because they are designed with a wide seat and a tall back to conform to your body for many hours of comfortable support. Just grab a chair and compare! FREE Fast Shipping! 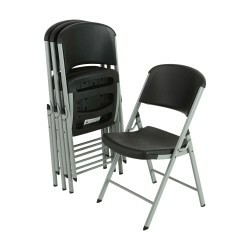 Lifetime’s card table folding chairs are contoured for superior comfort. Our card table chairs are designed with a wide seat and a tall back. 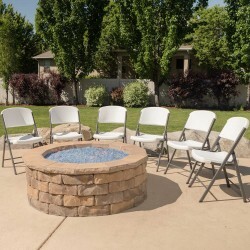 These card table folding chairs are perfect for accommodating your family and friends on game night or providing extra seating for backyard gatherings.FREE Fast Shipping! Lifetime Light Commercial Folding Loop Leg chairs are designed with u-style legs that won't sink into the lawn at outdoor events and a contoured seat and tall back for comfortable support. Constructed from durable polyethylene plastic with a powder-coated frame. FREE Fast Shipping! The Lifetime Light Commercial Contemporary Chair has style, comfort, and durability with the added convenience of being lightweight and portable. Constructed from high-density polyethylene plastic and powder-coated steel for use indoors and out.FREE Fast Shipping! Wide contoured seats keep you and your guests comfortable no matter how long the game last. Lifetime chairs are designed with extra tall, slightly reclining backs which are contoured for amazing back support as well. 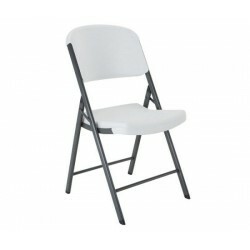 Many people say our Lifetime folding chairs are even more comfortable than a padded chair!FREE Fast Shipping! If you enjoy having friends and family over for fun and games, invest in Lifetime heavy-duty folding chairs. Constructed from high-density polyethylene plastic with a steel frame, these portable chairs are built to last.FREE Fast Shipping! 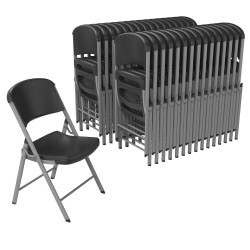 Lifetime Classic Commercial Folding Chairs (4-pack) - Features a blow-molded seat and back (black) with a steel folding frame (silver). This model comes as a 4-pack with a 10-year limited warranty.FREE Fast Shipping! 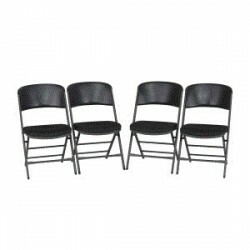 Lifetime Classic Commercial Folding Chair (4-pack) - Features a blow-molded seat and back (putty) with a steel folding frame (black). This model comes as a 4-pack with a 10-year limited warranty. FREE Fast Shipping! The Lifetime Light Commercial Contemporary Chair has style, comfort, and durability with the added convenience of being lightweight and portable. FREE Fast Shipping! Whether you're looking for some extra seating for your next family gathering or an attractive option for a friendly bonding. 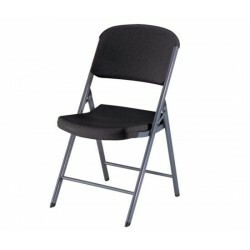 The Lifetime Classic Commercial Folding Chair is what you need. It is contoured for maximum comfort. With thin folding profile for easy storage, stain resistant and easy to clean.FREE Fast Shipping! Lifetime Contemporary Padded Folding Chairs is a blow-molded seat and back (charcoal gray) with a Premium Steel folding frame (gray). This model comes as a 4-pack with a 5-year limited warranty. FREE Fast Shipping! 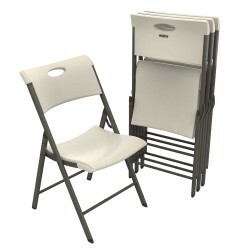 Lifetime’s card table folding chairs are contoured for superior comfort. Our card table chairs are designed with a wide seat and a tall back. 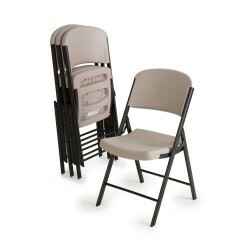 These card table folding chairs are perfect for accommodating your family and friends on game night or providing extra seating for backyard gatherings. FREE Fast Shipping! 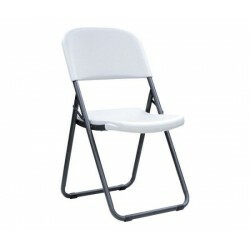 Contoured folding chairs from Lifetime Products are the most comfortable folding chairs on the market. Wide seat and tall back conform to your body to provide many hours of comfortable support. Try one out and see why so many people won't settle for anything less!FREE Fast Shipping! Get heavy-duty office tables and chairs from Lifetime Products. 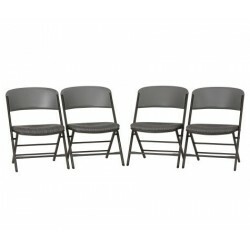 Buy comfortable contoured Lifetime folding chairs in bulk for less! 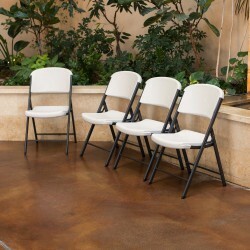 For durability and long-lasting comfortable support, you can't beat Lifetime folding chairs.FREE Fast Shipping! Lifetime Classic Commercial Folding Chair (4-pack) - Features a blow-molded seat and back (black) with a steel folding frame (silver). This model comes as a 32-pack with a 10-year limited warranty.